Guild of Dungeoneering operates on the synthetic edge of a few game design trends. It has the mechanical heart of a roguelike. It has a progression of “out of dungeon” upgrades that augment its roguelike core. The combat is driven by a deck of cards that you build through gathering equipment within the dungeons, and yet your initial deck is determined by what kinds of upgrades you have built up in your Guild, that “out of dungeon” system I mentioned above. Sometimes going into a dungeon isn’t a pure roguelike experience, and instead you are presented with a turn-based time trial or a tile-based puzzle that you need to solve. Oh, and you also build each dungeon turn by turn. Guild of Dungeoneering is complex. I’ll admit to bristling at that complexity. Despite my love of obtuse mechanics and obfuscated controls in action games, the spiraling multitudes of strategy or tactical games has always frustrated me to no end. I will bounce off of Crusader Kings II all day long, but I’ll stick it out for 3rd person tank controls like you wouldn’t believe. I have a frustration threshold that I reach fairly quickly with some genres of game, and Guild of Dungeoneering could have easily surpassed it and rocketed off into the orbit of Planet Whocares. Importantly, it didn’t. The game patiently and quickly explains all of its major systems to you, and anyone with a passing familiarity with upgrade systems in games should be able to see how in-dungeon equipment works or how the Guild building upgrade system functions. At the same time, anyone without that passing familiarity could have a hard time. In a purely experiential way, I had trouble identifying the gain and loss of benefits with equipment initially, and the Guild menu will tell you that you’ve done things like “unlock the Apprentice” without telling you up-front what that actually means. It all takes a bit of patience. It’s a tactical system that is intuitive and color-coded and any attempt to explain it through language is wasted because two minutes actually fiddling with the systems make them incredibly apparent. It is excellent design. It feels like Rock Paper Scissors melded with a version of Magic: The Gathering that someone dreamed up after reading the basic rulebook and then playing a game of telephone for about a decade. It works, and it is fun, and there’s some real nail-biting seriousness about it when you and your enemy are both down to a small amount of health each. Like I said, Guild of Dungeoneering does a great job of synthesizing mechanics that we see getting developed in the current roguelike, post-roguelike, roguelike-like era, but one of the main draws of the game (and the first thing that made me vaguely aware of the game around a year ago) is the core mechanic of building a dungeon as you progress through it. You have a set of cards, and you can play three of those per turn. You can place a dungeon tile (usually a room or hallway), put a piece of treasure in a room, or place a monster. You have to carefully balance these three things in order to get loot, kill monsters to get items and levels, and connect already-existing dungeon tiles to one another to either solve a puzzle or get the Big Bad at the end. When it works, it really works. The turn-based system for placing tiles is really nice when it comes to deliberate play, but I’m impatient. I want to lay the tiles, move my character, and make it through the dungeons. This is a game that, at its core, wants me to make tactical decisions and act on them, and when the game doesn’t move at the speed of my tactics (which are hurried and impatient), I get antsy. Sitting through card placement animations is not stimulating. Listening to the sound of things being drawn withers me. It’s the smallest complaint, really, but it is an aesthetic drag on a game that excels otherwise. There’s also a bard who sings when you unlock things or begin missions or generally do anything and after about an hour I turned the sound off completely because I could not stand it. It’s a pure binary: you either love bards or you hate them. Bards are not for me. I’d be remiss if I didn’t mention some of the technical issues that I have had with the game, even though I am confident that those issues can and will be fixed ASAP by the developers. It was very unclear to me what buttons should be double-clicked and which should be single-clicked, and to do some actions I ended up wailing on the buttons until the game decided to respond. It was unclear whether the game registered the initial click and was now loading and ignoring input or if it simply didn’t know I was clicking. I also had one pretty severe glitch the forced me to close my game after a dungeon tile became stuck to my cursor. It finally disappeared, but I couldn’t click on anything else. 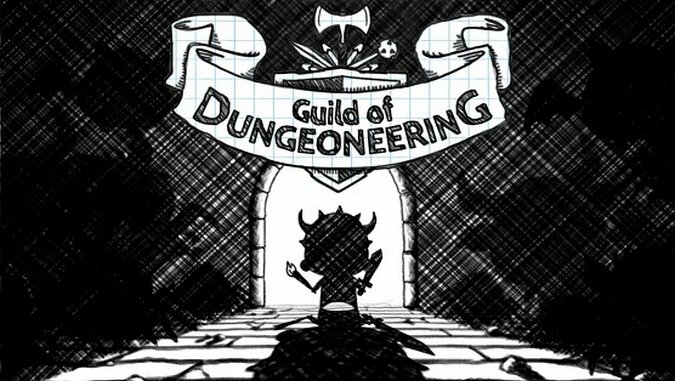 Guild of Dungeoneering might be my new thirty-minute game, unseating Spelunky as the game I play while waiting for dinner to finish cooking or while I’m listening to an album. It keeps me playing without bleeding me dry, and I think about lost fights and incomplete dungeons for longer than I should while not playing the game. In fact, I’m thinking of a bad move I made in the game and trying to figure out which character would enable me to complete a dungeon right now while I’m writing this review. I play a lot of games for professional and personal reasons, and very few of them stick with me for fifteen minutes, let alone all day. Guild of Dungeoneering is still clinking around up there in my noggin, and I think that means something. 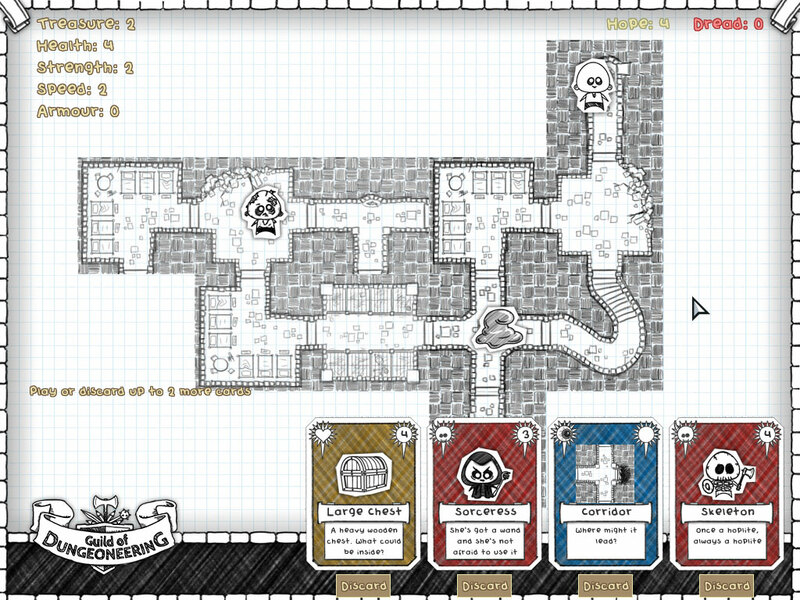 Guild of Dungeoneering was developed by Gambrinous and published by Versus Evil. It is available for PC. Cameron Kunzelman tweets at @ckunzelman and writes about games at thiscageisworms.com. His latest game, Epanalepsis, was released on May 21. It’s available on Steam.